When I was little, I would sometimes tag along with my Mom when she went to work. Work, being her Spanish restaurant. Over the 34 or so years of El Comedor (that means the “Dining Room” which was what the restaurant was called), some of my best memories was when I was allowed inside the kitchen to watch the cooks as they went about their work. None of the cooks in El Comedor ever went to cooking school, I am pretty sure none of them even graduated high school. They originally started as house help (doing the cleaning) for my Grandmother (who we fondly called Mama). When she started the restaurant they were tasked to cook in the kitchen. Imagine if you will, a young man, Manny (his nickname for Manuel), who has never finished high school, who has never picked up a cookbook in his life, never held a chef’s knife, never tasted paella, being asked to give up cleaning, the only job he has ever known, to cook in a fine dining Spanish restaurant? It must have taken a leap of faith by my Grandmother, and Manny to both give it a go! When Ellie mentioned Spanish food to me recently, I realized that I have been very delinquent in posting some of the delicious recipes I remember eating so many years ago when Manny would sneak a little tapa to me while no one was looking. I must have looked like a drooling labrador to him, just watching him cook. And I guess he took pity on me. “Don’t tell your Mom okay?” he would say as he handed me a little croqueta or some of the stuffed mussels pictured above. At the restaurant we called them Mejillones Relleñadas. I call them – Mussels a la Manny. 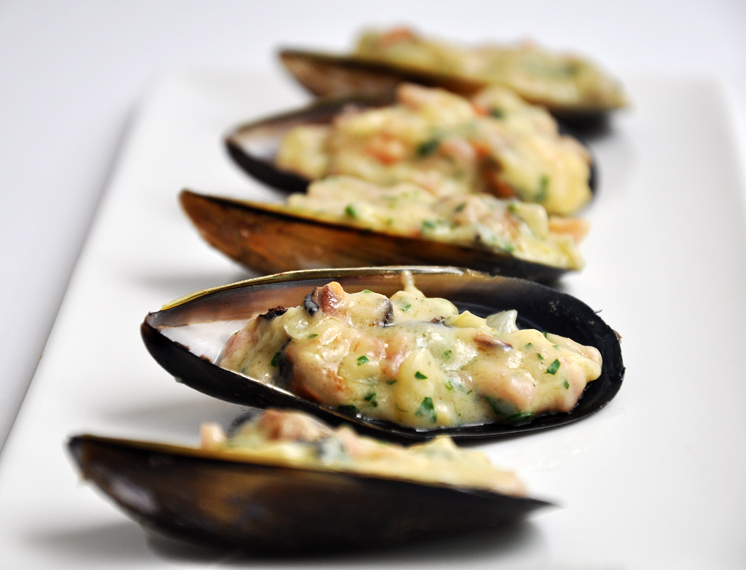 They are made with mussels, ham, white wine, an uber creamy bechamel sauce and topped with parmesan cheese. This recipe is so simple and you can make it ahead, just top with parmesan cheese and let it rest in the refrigerator until you are ready to serve. It’s perfect when you are expecting guests – just bake them in the oven prior to serving. Sadly, Manny passed away a few years ago but to this day I still think of him when I make this dish – from something that has very humble beginnings – such a beautiful dish! They're delicious even without baking! Place the mussels in a pot of cold water and bring to the boil. When they are open, remove from the heat to cool. Be careful not to overcook. 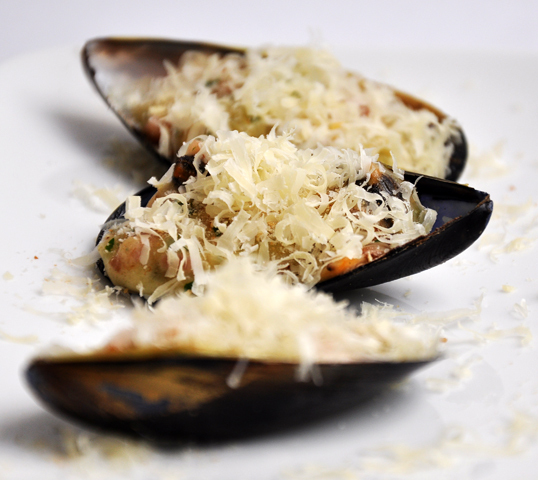 When they are cool enough to handle, remove the meat and chop (not too finely) and reserve half of the mussel shell. Heat the butter and olive oil in a sauce pan and add the onions, salt and pepper. Add the garlic and cook until translucent. Add the ham and cook for another 2 minutes over medium heat. Add the flour and cook out for a few minutes, then add the white wine and cook for two minutes, and then gradually add the milk. Add the chopped mussel meat and the parsley. Place a spoonful on the reserved mussel shell. Top with parmesan cheese and bake in a 180c (fan forced) oven for 10 minutes until the cheese has melted. BY THE WAY, on the side of this post is a link called RECEIVE EMAIL! If you would like to be on my mailing list and receive an email when a new post is up – please click on the link. Thank you! Mussels are my very favorite! Love this recipe- am so bored with mine! What a lovely story. How great that your mother was in the food business. I can see where you get your passion? I so want more Spanish dishes! A post with a delicious recipe and a lovely story—good way to start the day; thank you! This looks awesome. I will definitely try this on our next family get together. Thanks Trissa. wow, que delicia! para chuparse los dedos!. I adore mussels but sometimes I’m lacking of good recipes or inspiration and always end up cooking them same way (mules frites …). gracias to you, I have another recipe now!. on December 1, 2009 at 2:12 pm | Reply Elizabeth F.
These look amazing! 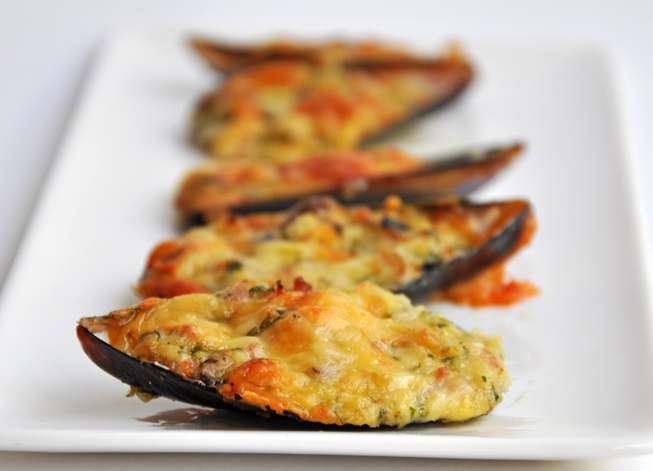 I have never seen stuffed mussels and I am loving this recipe and every single one of your photos! Ummm mussels… Spanish cuisine is my favourite and I seriously could spend eternity eating Spanish tapas and seafood dishes. Your mom ran a restaurant?! That’s soo cool.. I am sure it was a lot of work but that’s a great way for you to be introduced to the world of flavors!!! I’m a big fan of mussels. I can eat at least ten mussels at a time. These look gorgeous! We generally stuff it with rice and an outstanding spice, ground black pepper. We squeeze lemon on them while eating. I’ve never seen a stuffing like yours, I must definitely try it. What a lovely story! These look to die for! Wow…these looks very delicious. I love mussels & always cook in sambal. I must try this for a change…just bake them…so simple. Thanks for sharing.